The new APiJET Proven Partner Program was created to ensure that all components in an end-to-end solution will integrate and work well together. In addition, APiJET and its partners are committed to resolving any issues. 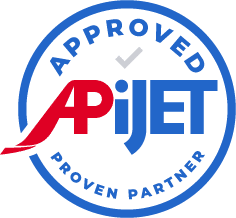 APiJET™ is the newest Aviation Partners company to continue the tradition of changing the shape of commercial aviation by delivering real cost savings and efficiencies to the global aircraft market. The APiJET suite of on-aircraft and ground based analytics and applications is a low cost, high value commercial aviation data service that helps airlines drive new operating efficiencies and cost savings across all organizational units. SMART AIRCRAFT™ drive SMARTER OPERATIONS. The APiJET solution has delivered value for Icelandair from the first installation. The ability to deliver value across the entire airline is unlike anything in the market today. We’re so happy with the product and team that we’re also installing it on our new 737 MAX. Gather data and insights from your most valuable asset – your Aircraft. Integrate those insights into your processes to streamline operations and save money. It’s a no CapEx, cross-organizational tool to increase your bottom line profits. As a SaaS product, you start saving money immediately with your data in your control. Payback in months, positive ROI in less than a year. The APiJET Smart Aircraft System is software as a service (SaaS) that uses existing or dedicated infrastructure to deliver exceptional return on investment and payback. With no upfront CapEx and immediate analytics-driven-alerts to operational staff and applications, the ROI begins immediately and grows as deeper insight is gained through the use of the APiJET Smart Aircraft System. APiJET’s Smart Aircraft System integrates existing aircraft operational data, IP communication links and airline ground systems into a single connected service that gets the right information, to the right place, at the right time. Proprietary APiJET Actors perform real-time data processing to power on-board, ground and cloud based applications that provide operations personnel real-time cost savings input and analytics. The Actors provide a continuous loop that allows algorithms developed on the ground to be “forward deployed” to your aircraft so that your aircraft and operations get smarter over time. APiJET’s Data Services, Applications & Analytics turn data into operational insight.